In Part 2 of my buying guide, I go over a few options for beginners who don't have any paint products and want some ideas on what to buy to get started. In our previous post, we explored what it costs to buy into Legion from the physical miniatures standpoint. Now, let’s take a look at what it costs to assemble and paint your miniatures if you’re starting with nothing. First things first: Legion miniatures are unprimed. This means that, like most miniatures, they are plastic through and through, so paint won’t stick well to their surface. Using a spray primer, however, allows you to coat each miniature in an extremely thin layer of primer paint that lets paint stick on the miniature with ease. If you’re just starting out, you only need one or two different colors. If you’re primarily painting Imperials go for white (Stormtroopers) and black (Vader and Speeder Bikes). If you’re primarily playing Rebels, you can probably stick to just grey and add black if you need it. Most miniature enthusiasts will stick to brands like Tamiya Fine Surface Primer (low cost, possibly harder to find) and Citadel (a Games Workshop brand, generally more expensive. However, Krylon Colormaster (not to be confused with the makeup brand Kryolan) is easier to find at stores like Michael’s and can do in a pinch if you spray very carefully. Every hobbyist has an opinion on which the like the most, but I’ve personally used all three with great success. Before priming, watch a couple of tutorial videos and work in an open, well-ventilated space. I live in a big city, so I have to make do with my stoop. Primer should set you back between $10 USD and $20 USD per can, depending on the brand. 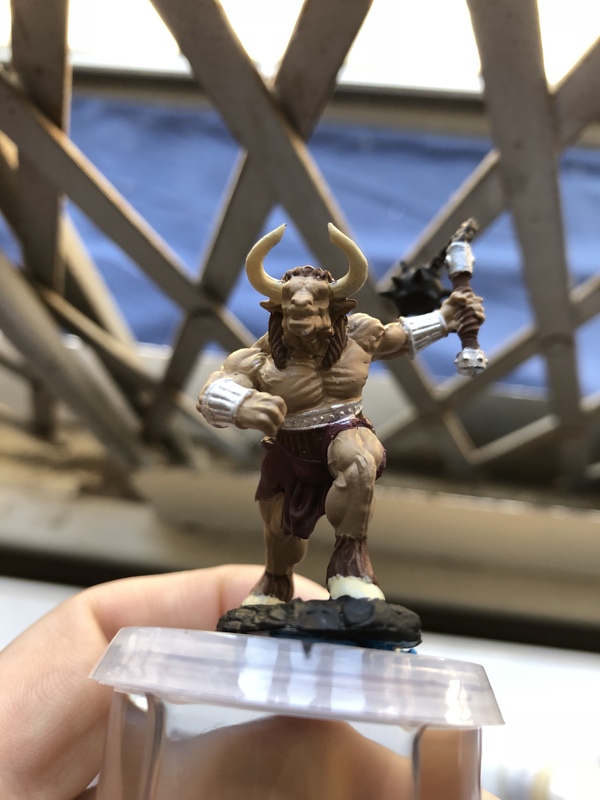 For a beginner just jumping into the world of miniature painting, it can seem like a terrifying choice – it was for me! Fortunately, there’s no need to dive into a massive set when you’re first starting out. The basic Legion miniatures require only a few different colors to look decent (black, white, and red will cover the vast majority of Imperials), and those little canisters go a surprisingly long way. Note: these are not affiliate links and I am not making any money from referrals. I personally went with the Vallejo set and, several months in, am still working my way through it. However, I also own a few Army Painter bottles and find them of equally high quality. Not only do these set you up with all the colors you could need for a low price, they also have the advantage of coming in small dropper bottles, which help you control the amount of paint you’re using. Citadel paints, for their widespread popularity, run a bit more on the expensive side and come in well bottles so that you have to manually transfer paint to your palette, likely leading to more waste with beginners. Dropper bottles, on the other hand, are perfect for beginners and less likely to dry out quickly. Now that you’ve got your paint, what about brushes? It might be tempting to buy expensive, high quality brushes right out of the gate. I’ve found, though, that following an old adage is extremely useful with mini painting: buy cheap to start, and replace with pricier items as needed. I purchased a $5 USD brush set off of Amazon that came with ten brushes, and nearly three months in I’ve only had to purchase one additional detail brush since then. You can find other, similar sets easily. Go with whichever one strikes your fancy, then replace them one by one as they get too frayed to be useful. All in all, paint and brushes should set you back around $40 USD – $50 USD. Often called “talent in a bottle,” washes or shades are diluted, dark paints that when applied correctly fill in the crevices and recesses of your miniature to give it natural shadows and highlights. 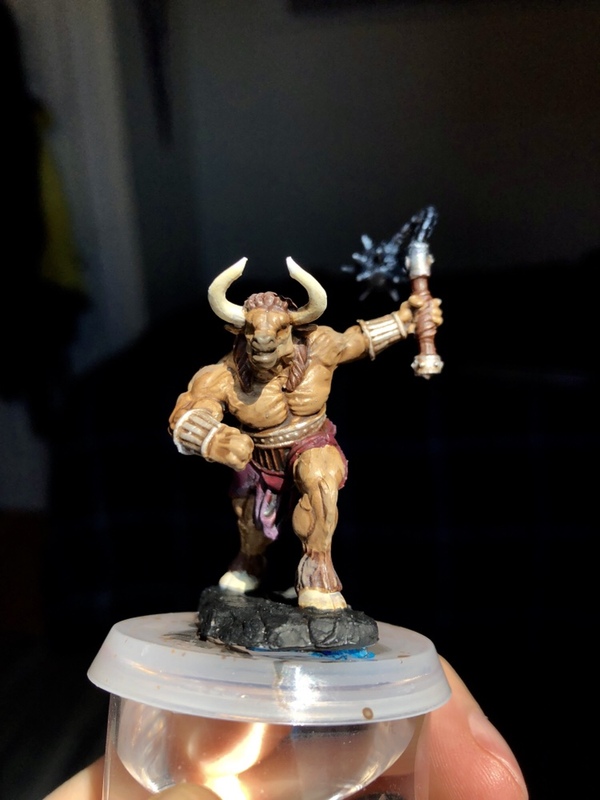 You can see the difference below in the first mini I ever painted (a D&D Minotaur) – take a look at the chest and bracers, especially. They come in a whole host of other colors, but brown and black will suffice for now. If you’re only going Rebels you could get away with just the former, while Imperials would want to grab the latter. Make sure to watch a good tutorial before you use it, though! You could also buy a can of The Army Painter’s Strong Quickshade for $30 USD and dip to your heart’s content. Realistically, though, you only need to spend about $8 USD on one wash to start. All of this should easily be purchasable for $25 USD or less. Quite a bit to think about, huh? The good news is that while it’s a comparatively large upfront investment, the paint and supplies you buy now will likely last you for months, and you’ll only need to chip in small amounts to refill and replace as you go. In total, paint and supplies should run from between $85-$150. Which brings our grand total from part one to roughly $200-$350. It’s worth mentioning, of course, that you don’t have to get super into painting miniatures. Maybe you’re more interested in the war gaming aspect of Legion, in which case it’s fine for casual games if you simply ad hoc assemble your miniatures or spray paint them one color (black for Imperials and white for Rebels? or maybe you’re adventurous and spray paint an all-gold Darth Vader). As it stands, you should have a much better idea now of what entry into Star Wars Legion will truly cost you. From here on out it’s under your control. Best of luck as you embark upon this new adventure! Anything I missed? Other tips to consider? Throw a comment below! If your new and worry about ruining your models. You can always buy a bag of plastic army-men, was these in warm soapy water because of release agents. Practice trimming mold lines, priming, and paint a few. Also get some bottle caps and blue tack to mount your minis on to avoid handling them.